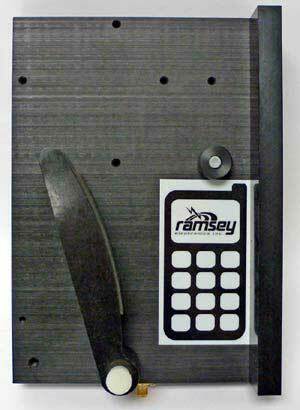 In 1997 Ramsey took the technician out of the large expensive shielded screen room and put his hands and eyes into a portable bench top RF Shielded Test Enclosure. With thousands placed in service worldwide the patented STE technology became the standard for efficient and cost effective RF isolation testing. That legacy has continued with a wide variety of STE’s to suit every RF test application, and size requirements you have today. Our exclusive double lip gasket technology assures an RF tight seal each and every time. Steady-hold hinges maintain the opening at any location and prevent gasket compression due to prolonged closure pressure when not in use. Our STE2800 and STE3800 STE’s feature our RTF Radiating Test Fixture with a built-in broadband antenna to properly test wireless telephones with guaranteed repeatability. All of the STE’s feature a wide variety of available I/O connection and interface options and RF filtered feedthroughs. Interference Free Testing FOR YOUR 802.11 EQUIPMENT! Great isolation beyond 8 GHz! The STE2200 evolved from its big brother the STE3000B. 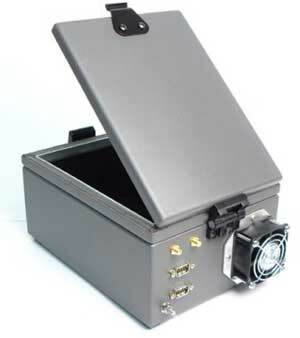 Designed specifically for TDMA, CDMA, AMPS, PCS, GSM and other small communication devices, it is constructed to the same precision-machined tolerances as our patented STE3000B to maintain an exceptionally well shielded environment. Heavy duty, rugged .090 and .125 aluminum is used throughout and our double lip double high performance gaskets are used at all joint locations assuring a reliable RF tight closure. 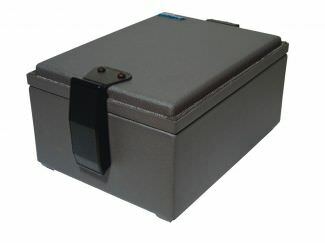 Oversized hinges and latches are used to provide a physically tight seal every time. RF absorbent foam lines the interior to provide a typical RF attenuation of -90dB @ 3GHz! Perfect for 2.4GHz testing. Input/output connections and options can be configured to match your needs. RF TIGHT TO 8 GHz AND BEYOND! The STE2200 is constructed to the same precision machined tolerances of our patented STE3000 to maintain an exceptionally well shielded environment. 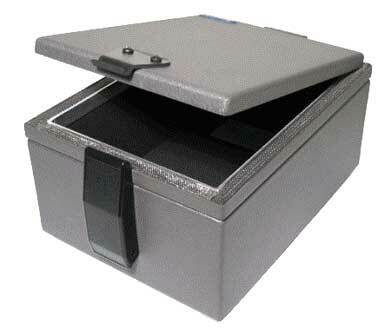 Heavy duty, rugged .090 and .125 aluminum is used throughout. Then we went to work to assure an RF-tight seal up to 8 GHz. 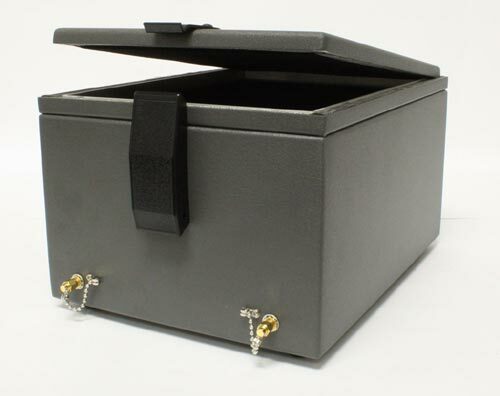 First, we engineered the box with a special double lip to provide better attenuation at higher frequencies. Then we embedded double woven monel flexible gaskets throughout the lip at all joint locations. In addition, all inside surfaces are lined with microwave absorbent foam to attenuate stray RF signals during your test. The results? 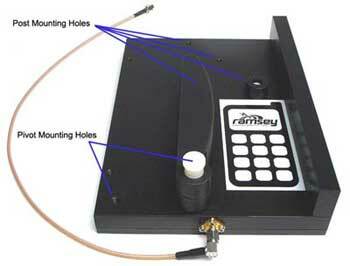 Better than -75dB attenuation at 8 GHz, and greater than 90 dB down at 2 GHz! 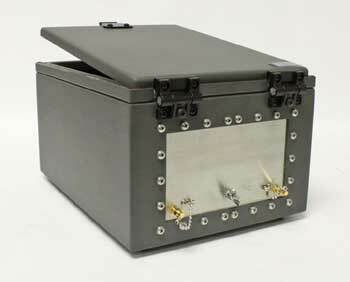 This is one tight RF enclosure! The STE2200 is provided standard without filtered input/output connectors for your custom applications. 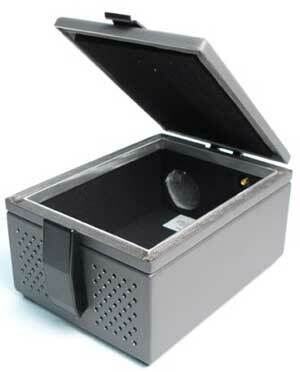 The STE2300 is constructed to the same precision machined tolerances of our patented STE2200 to maintain an exceptionally well shielded environment. 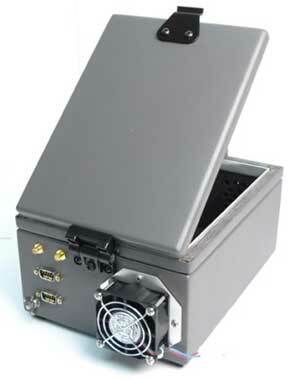 Heavy duty, rugged .090 and .125 aluminum is used throughout. Then we went to work to assure an RF-tight seal up to 8 GHz. 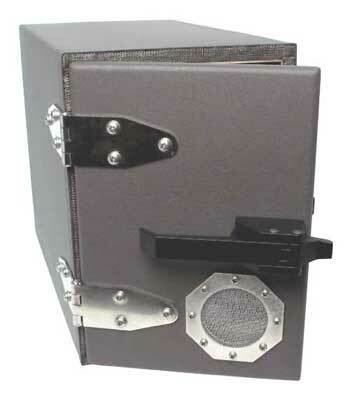 First, we engineered the box with a special double lip to provide better attenuation at higher frequencies. Then we embedded double woven monel flexible gaskets throughout the lip at all joint locations. In addition, all inside surfaces are lined with microwave absorbent foam to attenuate stray RF signals during your test. The results? Better than -75dB attenuation at 8 GHz, and greater than 90 dB down at 2 GHz! This is one tight RF enclosure! 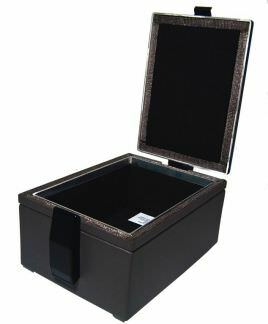 New small size with a standard removable I/O panel! The STE2300 is provided standard without filtered input/output connectors for your custom applications. 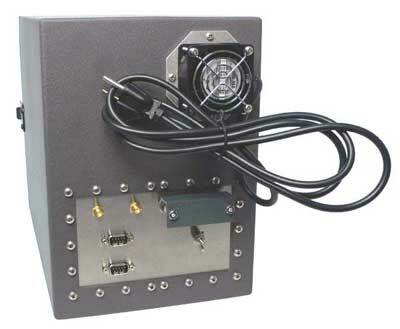 Radiating Test Fixture (RTF) with a built-in broadband antenna to properly test wireless telephones with guaranteed repeatability. 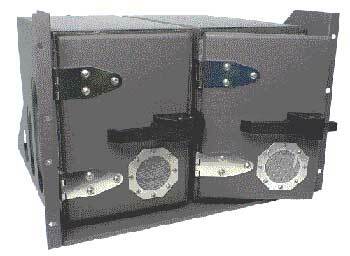 The STE2900 is designed to be dual rack mounted in a standard 19” EIA rack enclosure. The 7 R/U dual enclosure is designed for multiple simultaneous testing of blade servers, cards, WAP’s and other wireless devices. RF isolation is greater than -75dB at 6GHz and fan forced cooling is provided for devices under test. Like other Ramsey STE’s, a universal I/O plate is provided for rapid modification and customization of customer requirements. 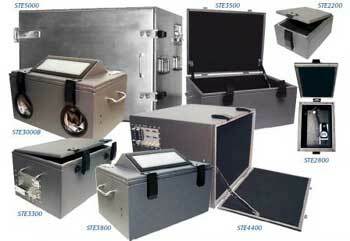 The STE2900 is available as a single enclosure, or a dual enclosure set installed on the matching 19” rack shelf. 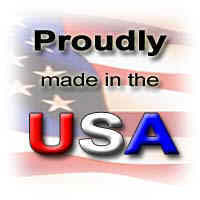 The “Top Load version of the STE2900! 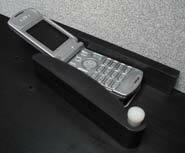 Also designed for individual bench top or dual rack mount installations, the STE2950 makes it simple to load and unload the device under test with its top load access door. 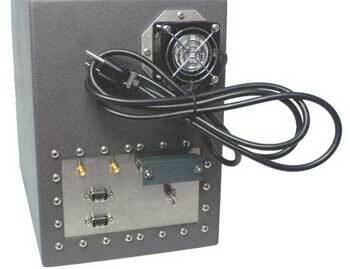 The dual rack mount configuration allows multiple installations for dense pack environment testing. To allow proper cooling of the DUT each STE2950 includes a built-in passive 60mm vent option. Optional forced-air fans can be ordered for additional cooling. Like other Ramsey STE’s our universal I/O panel on the back wall is included and ready for your custom configuration to meet your application. Heavy duty, rugged .090 and .125 aluminum is used throughout and our double lip, high performance gaskets are used at all joint locations assuring a reliable RF tight closure. RF absorbent foam lines the interior to provide a typical RF attenuation of -90dB @ 3GHz! 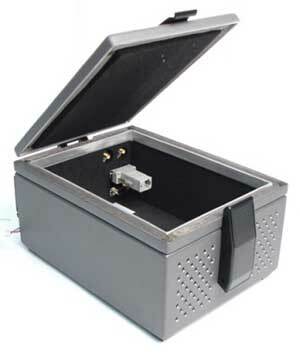 If you are looking for an off-the-shelf RF enclosure system providing enough room to test any size wireless device, from Cellular phones to MIMO access points, you can count on the STE2950 to keep the device isolated. The dual rack version STE2952 includes a custom rack slide allowing the entire enclosure to be pulled out for top access. 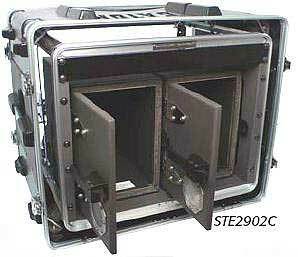 The STE2952 includes dual STE2950’s mounted on a custom 19” rack mount slide ready for installation into your rack. 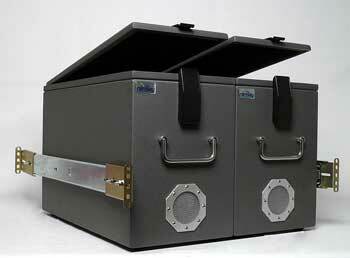 Access to the DUT is easy by the pull-out slide giving you full access to the hinged top mounted shielded doors. If you don’t have available rack space or need high density testing in the field, our STE2952C has dual STE2950’s pre-mounted and configured in a custom shock mounted road case. Great for field service trips.